Today, January 31, Wirtland is pleased to announce the winners of first Mi ss Wirtland Beauty Photo Contest. The jury has calculated the individual score of each photo, taking into account the rating (stars), number of visits, and each photo's period of exposure on the site (to equalize photos which were submitted on various dates). Thanks to our jury's objectiveness and diligence, and use of sophisticated IT technologies, we now have the absolute winner. And the winner is... ANELIA!!! Congratulations to Anelia! We also are pleased to announce two other winners with highest score, who have the title of Vice-Miss: DIMITRINKA and VANESSA ! The organizers wish to thank all the participants of the first contest, and to welcome everybody to our next contests and other new exciting events. Though Miss Wirtland 2009 Contest is now over, we already have a brand new project to announce: WitiFriends, a global meeting point for Witizens and their friends. It's a personals site registered in Wirtland, which helps people to find friends or someone special, and also to spread the word about Wirtland. WitiFriends offers all basic services free, and is available in 12 languages of the world! Reflecting growing interest to Wirtland in Bulgaria, the nation's leading TV channel bTV organized a live show on February 11, and invited several Witizens, including Dimitrinka Karaangova, Vice Miss Wirtland. The video of Dimitrinka and other representatives of Wirtland being interviewed on Bulgarian TV can be viewed here. Following up to wide coverage in Bulgaria, leading newspapers in neighboring Turkey and Turkish CNN also featured articles on Wirtland, or Hayalistan, as they nicknamed it (click here for more detail on coverage in Turkey). Come back to read the latest updates. The Turkish version of Citizenship Application Form is now available. It is now possible to follow Wirtland in your own language. The first "localized" Twitter feed (click here) is in Bulgarian language, as Bulgarian-speaking people are a considerable part of Wirtland's population. It is still a Beta version, and comments from Bulgarian experts are welcome. (The main Wirtland's Twitter page is http://twitter.com/wirtland.) The Bulgarian version of "The Times of Wirtland" is also available: link. During last week two new articles about Wirtland have appeared in the U.S. printed and electronic media. "Do you ever feel like you just want to get away? Well, how about going to a country where you don’t need money and you can make your own rules and you can be one of the most important people. Sound too good to be true? Well, this country does exist (on the Internet) and it’s called Wirtland", - writes "Maryland Daily Record" (Baltimore, Maryland) on January 23, 2009. "This is a fascinating concept", concludes Larry Fiorino, author of the article "Wanna get away? Try a virtual trip to Wirtland", who is founder and chief executive of G.1440, a Baltimore-based e-solutions firm. Click here for full text of article. "Internet Evolution" on January 21, 2009, published article "Wirtland Evolves as First Country in Cyberspace". "Don't ask about a business model; there doesn't seem to be one. Luengo [press attache of Wirtland who was interviewed by the author] maintains that Wirtland is not a commercial project supported by investors. The mission is loftier and more romantic". The author of the article Deborah Nason is a freelance writer based in Connecticut. January 20, 2009 - Wirtland sent yesterday an official letter congratulating the new US President Barack Obama, on behalf of the people of the first internet-based country. You symbolize the hope for positive changes of the American people, and also of a major part of mankind. Please accept warmest congratulations and best wishes of success from the citizens of Wirtland, the world's first internet-based sovereign country,“ the Address read. In the letter, signed by chancellor of Wirtland, it is also emphasized that among many features that make President Obama’s presidency unique, there is also an unprecedented use of modern internet technologies in his electoral campaign. Chancellor of Wirtland expressed his belief in US President’s understanding of the concept and perspectives of the internet-based country, which transcends national borders without breaching or lessening the sovereignty of any countries. True to the principles of consensus of the first web-based country, the official congratulation letter was written based on contributions from Witiziens. A whole range of brand-new features have appeared on the websites of Wirtland after the New Year holidays. A new section "Projects" has been added to Wirtland website. It will display logos with links to main independent projects being developed in Wirtland, including those which are in beta testing stage - such as Virtual Duty-Free and Wirtland Medical Centre. Witizens of Wirtland Network has got its own built-in automatic translation tool. The tool from Applied Language Solutions offers instant translation to 10 languages: German, French, Spanish, Dutch, Portuguese, Italian, Russian, Chinese, Japanese, Korean. The current version of translation software changes the layout of translated pages, making it more simplified. The work is underway to ensure seamless integration of this translation utility into the Witizens website. 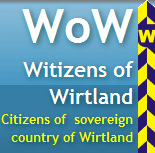 Facebook users can now become 'fans' of Wirtland by visiting this new page. Also, Facebook users may now follow the news of "The Times of Wirtland" (link), and updates of Witizens' Network (link). These are additions to the existing "Witizens on Facebook" Group. 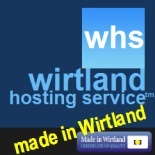 Twitter users are now welcome to follow all Wirtland updates at twitter.com/wirtland.